Buildings house - Construction de maison à Khao Lak-Thailande, maison à vendre, vend terrain et villa, house for sale in thailand, build builder house in thailand khao lak, land for sale khao lak,Property-Real Estate. Here you can discover one of all villas propositions. We present you two villas with two or three bedrooms, or more if you want. It's only a building examples, because you can ask us a reproduction, modify a plan, or to give us directly your final plan ready for start. Other solution, we creat together with our architect your dream house according in your budget and your wishes. The robustness and isolation are our raw rules under construction. -the Double walls +/- 20 centimeters with an air gap in the middle in terms of exterior walls. -A steel quantity supperior to normal in terms of reinforced concrete. -The Roof structure in steel and aluminum. It's part of our design criteria. 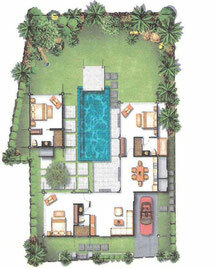 Villa with 2 bedrooms, same base than the villa with 3 bedrooms but without the bungalow bungalow. For more informations, sent us a mail.